Hornwort or coontail (Ceratophýllum in Latin) is the most popular tank plant for beginners! Why? Well, simply because it is not demanding and it can grow at low illumination level, in cold water, easily reproduces and it doesn’t cost a fortune. Moreover, this plant is a good biological filter. Firstly, because it collects all ‘rubbish’ on itself including fish waste products and rot off organic matter. Secondly, because this plant effectively ‘pulls out’ nitrates (nitrogen cycle end product) from the water. 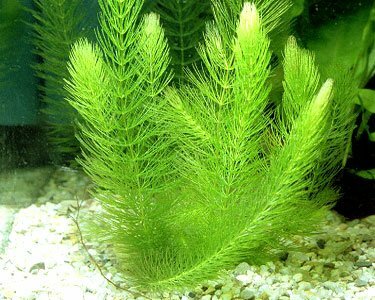 By getting a Hornwort a beginner aquarist can sufficiently improve parameters of his new tank, since it is beneficial to settling of biological balance. As well as its owner gets the experience of how to grow and take care about tank plants without being afraid that the plant will wilt. Hornwort is a plant from Ceratophyllaceae family. Several kinds of the plant are known for now. They grow in slowly flowing rivers, lakes and ponds, but they differ in their appearance. For example, in African lakes there are small sized forms of the plant with coarse leaves. Hornwort natural habitat is rather wide; this plant dwells in all regions of moderate climatic zone, it is encountered in waters from polar circle to tropical ones. The plant grows in many lentic habitats or in slow flow areas of rivers, where is it completely submerged or it fixates itself to a river bottom. In the wild Hornwort is food for herbivorous fishes and birds. It is also used as food for domestic swimming birds. We should mention that, in fact, there are several closely related species under this name and you can see between them only by studying their inflorescence. As for the other characteristics these plants are identical. Coontail has long tough stems, its root system isn’t a developed one. That’s why the plant freely floats in medium and upper water layers. Hornwort absorbs nutrients directly from water; conducting elements of the stem are poorly developed and they contain storage matter – starch. The plant stem can be up to 1 m long; it is branchy and it easily breaks. Its leaves are acerose and serrated on top; they are gathered in verticils (6-12 leaves in each). The leaves coloring varies from light to dark green or reddish; they are easily torn off due to lime retention. A great plant for beginners! Does not require special equipment, care, or knowledge. Beautiful upgrade over plastic plants, which can look tacky and make your tank appear unnatural. Ships at 6-8 inches tall. The plant may fixate to the bottom substrate by means of its thin filamentary formations called rhizoids. Except holding the plant in the substrate, rhizoids also perform absorption function. The plant blooms with small flowers, some species have flowers gathered in little blossom cluster. This is a monoecious plant. One of interesting features of the plant is that its pollination happens under water as well, which is a very rare thing even among aquatic plants. This plant has been known in aquarium husbandry since the day the latter appeared. Besides, this is one of the most renowned tank plants among beginners. The reason of this long-lasting popularity is that Hornwort is undemanding and perfectly adapts to a vast variety of environmental conditions. The plant is also known for its ability to quickly absorb nutrients dissolved in water and this way suppressing algae growth in a tank. We should make a small comment for beginner aquarists – despite the plant unpretentiousness, yet you have to understand, that you shouldn’t expect it to survive at ‘spartan amenities’. The plant won’t grow without illumination, in really dirty tank with cold water and high concentration of toxic substances etc. As for using Hornwort as a tank plant, there are both those who support this idea and those, who don’t. In this case, you should take into account general idea of the tank decoration and your own suggestions in this respect. Many aquarists say that this plant is a must when you first start the tank; there Hornwort ensures settling of biological balance by absorbing waste products of tank dwellers. Besides, the plant produces oxygen and as a result organics accumulated in the tank quickly decomposes. Coontail is suitable both for tanks with cold water and for tropical ones. Hornwort isn’t demanding, it grows extremely fast (in a month a plant up to 1 m long can form from one shoot).The plant easily recovers even from a small branch after its leaves die-off, due to which it is perfect for beginner aquarists to keep. However, high growth rate can do a disservice when there are other plants in the tank and they can’t stand shading and lack of nutrients. Leaves and stem of the plant easily get broken and when they die-off, they become an additional source of organics in a tank. That’s why it is necessary to maintain the tank clean and timely remove floating rot-off particles of the plant with a scoop-net and trim the shoots which are too long. These issues don’t make experienced aquarists very excited and for this reason they very seldom use Hornwort in their planted tanks. Hornwort is rather undemanding plant that demonstrates high growth rate provided with proper conditions. You can put its bushes into the substrate or leave them floating in the water. It’s better to keep the plant in a spacious tank and regularly trim its shoots. Coontail prefers alkaline water (from 6 to 15 dGH), water acidity should be within 7.0-7.5 рН. Water temperature may vary within 17-30°С, however at lower temperature the growth rate of the plant slows down and its stems get down closer to the bottom. These plants prefer opaque light, at that daylight duration should be about 12-14 hours. Provided with intense light the plant can grow up to 3 cm long each day. If the plant doesn’t get enough light, it may shed leaves and its stem edges may begin to rot. In this case it is recommended to remove rot off parts of the plant, fix the illumination issue and Hornwort will quickly recover. The plant doesn’t require fertilizers, since its leaves absorb nutrients – phosphates, ammonia, CO2 and nitrites directly from water. Hornwort uses vegetative reproduction. Small pieces or sprigs of the plant easily strike roots into the substrate or grow new spurs when floating in the water. To fixate the plant in the substrate you can press it down with stones or other decorations. It is recommended to put Hornwort into a tank if you notice that there is a lot of algae in it. The plant competes for food with algae and it will promote fast cleaning of the tank, since this is one of the ways of biological algae control. However, in this case you shouldn’t apply algicides, because Hornwort is very sensitive to their content in the tank water, and it can lead to the plant death. Except its ornamental features, Hornwort is valuable as a biological filter. Suspended particles, food remnants and algae settle on it. If for this reason the plant appearance becomes less attractive, it is enough just to wash it under running cold water and remove the parts which became very dirty. In planted tanks Hornwort is largely used to decorate side and back walls of the tank and to hide the equipment. Thickly planted Hornwort looks good in the background together with other long-stalked tank plants. But more often it just floats in medium tank water layer. This beautiful plant can be a food for phytovorous species such as goldfish. Thin leaves of the plant are a good shelter for small sized tank fishes and their juveniles, some fishes may lay eggs among the leaves. For this reason, Hornwort is often put into spawning tanks, where its serves as an additional source of oxygen and a shelter as well. Juveniles of the following live-bearing fish: guppies, swordtail, platy, molly find their shelter in Hornwort leaves. 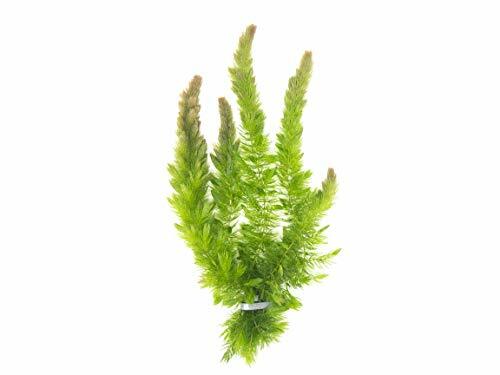 Hornwort is a perfect plant for those who are taking their first steps in aquarium husbandry. The plant is undemanding, it cleans water from the food remnants and toxic substances, grows fast and serves as a shelter for fish juveniles. For the same reasons this plant is of no interest for experienced aquarists. The plant is a rival for more demanding plants in a tank and it grows very quickly.